A widespread species that is not in danger of extinction. Mountains south of Polokwane, southwards along the Mpumalanga Drakensberg Escarpment through Swaziland to southern KwaZulu-Natal. Acacia-dominated woodland or wooded grassland, occurring on a variety of clay or loamy soil types derived from dolerite, sandstone, shale, quartzite, conglomerates, ironstone, dolomite and granite. 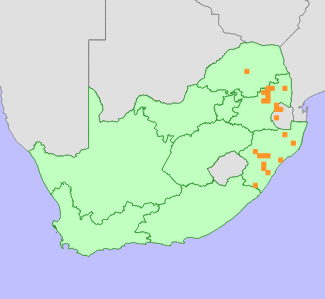 This species occurs as scattered individuals, except near Pilgrim's Rest in Mpumalanga, where it occurs in colonies (Venter 1993). This species is known from only a few, scattered records, but it is probably overlooked as it is easily confused with Ledebouria revoluta. Van der merwe, F. 1944. Scilla asperifolia. Flowering plants of South Africa 24:t. 944.